Most of the time I’ve spent in Sri Lanka has been in the centre of the country. 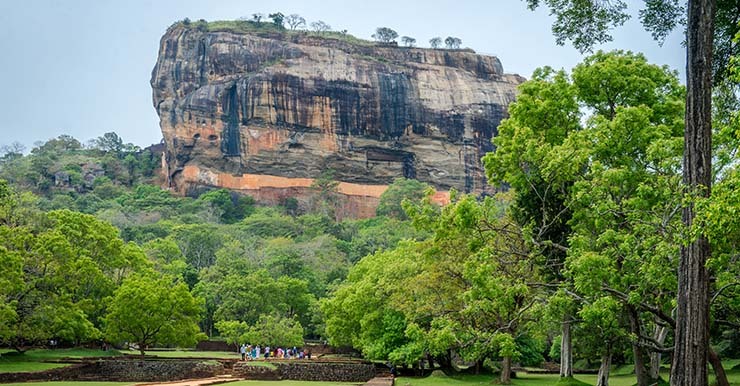 For some reason, on my first trip here I was drawn much more to the rolling tea plantations around Nuwara Eliya; the ancient ruins of Polonnaruwa; the famous rock of Sigiriya; and the gathering of elephants in Kaudulla National Park. I have been through the highlands and the mountains twice, seeing different aspects. Sri Lanka is an island, mapped by a border of coast, yet I’ve basically ignored most of what the shoreline offers. 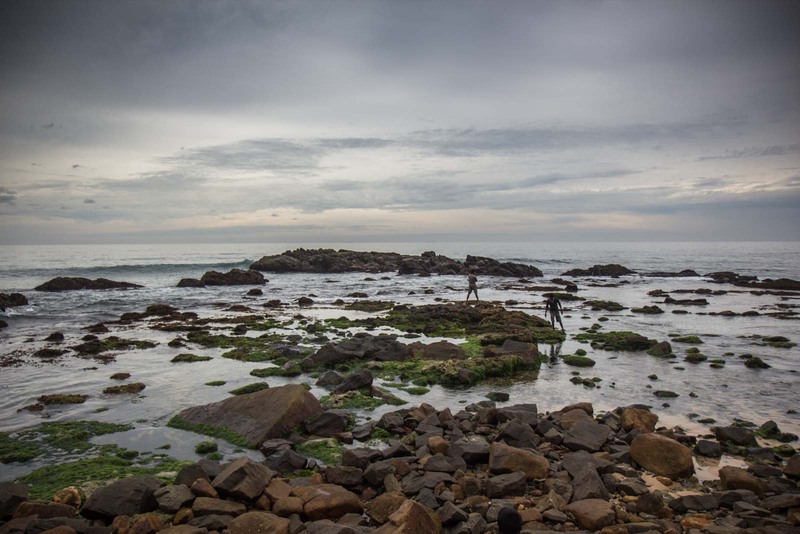 A quick stop at Galle and a night at Negombo is all I’ve seen – and I am the first to admit they were just cursory glances. It is only at the end of my trip that I can start to see a bit more of the coastline that is helping to swell a growing tide of tourism. A two night stay at the brand new luxury hotel Cape Weligama on the south coast gives me a chance to get out and walk… and walk… until I can walk no more. I trace the shore for hours before turning around and walking back for hours more. Along the sand, across rocks, through shallow waters, on the road, through grassy gardens I go. It’s a grey day with a sky threatening a storm, but I don’t mind. Along the way, I pass plenty of local Sri Lankans and most give me a smile or a wave. Waves all around me. When I get up on the road, tuk tuk drivers stop and call out… although they’re obviously hoping for some business, not just a reciprocal smile. Near a small rocky point, a man comes up to me with some kind of crayfish that he’s caught. He just wants to show them off and encourages me to take a photo of him with them. When I’m done he climbs back onto the rocks and throws the animals into the water. He was just catching them for fun but wants to make sure they live to be caught again another day. I make a friend along the way. A sandy dog with one of those faces that makes it look like it’s always smiling. The dog – let’s call it ‘Sandy’ – has a red collar which makes me think it might have an owner but a limp on one back leg that makes me think it might have run into some trouble. Sandy comes with me for about an hour, happily following along without seemingly wanting anything in return. When I sit on some rocks for a rest, it curls up next to me and I give it a good pat. When some other (collarless) dogs run up and start to cause some trouble, I chase them off. Sandy probably could have defended itself but I feel like I have a duty of care – we have formed such a close bond so quickly. Sandy disappears at some point, nowhere to be seen when I turn around after taking a couple of photos. Perhaps we’ve come too far from home. But we never said goodbye. It’s not a straight stretch of beach and there are new and striking textures around every corner. 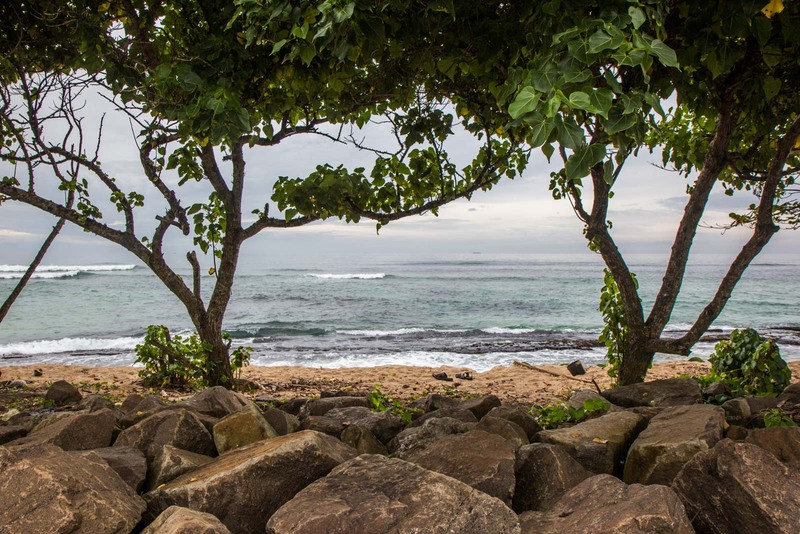 I love the waves crashing on rocks, the rolling patches of sand, the beautiful greenery that grows almost to the shore, the paths cut into small cliffs, and the rivers that meet the ocean. One of the reasons the shore is still so striking is because there has been little development here. There are some large hotels but they are generally set up on headlands or slightly back from the beach itself. Much of the accommodation along this stretch, at least, is small guesthouse style aimed at backpackers and surfers – family-run businesses often out of the family home. I like the mood it creates, a friendly and less-touristy feel to the more popular parts of the country but where you can choose between the most luxurious or the most simple just a short walk from each other. I won’t be writing too much more from this trip to Sri Lanka – I’ve covered most of the experiences on the blog by now. But this is not the end of the reporting I want to do in this country. There’s much more for me to see along the coast, huge national parks I missed, and a relatively undeveloped north to explore. I will be back to Sri Lanka, I have no doubt. Perhaps much sooner than I expect. Some countries you visit really leave an impression – you arrive as a tourist but leave as an ambassador. For me, Sri Lanka is one of those places. See you again soon. Where should you stay around Mirissa? There are a few great hostels in Mirissa but the most popular one is Mirissa Beach Hostel.For an affordable and friendly guesthouse with a great breakfast, have a look at Era Holiday House. If you are interested in boutique villas right near the beach, then IMAGINE Villa Hotel is a fantastic option.For a splurge, the accommodation and service at Cape Weligama is incredible! Time Travel Turtle was a guest of Cape Weligama but the opinions, over-written descriptions and bad jokes are his own. So wonderful to see such an undeveloped shoreline. I did have to make a double take at the first photograph of the fisherman up a pole though – it really looks like he’s checking his mobile and these days that wouldn’t surprise me. Beautiful photos, especially the ones of the fishermen on stilts. Looks like a gorgeous coastline. Stunning, moody photos. I will be soon visiting the country for an extended stay – looking forward to it. I was in Tallala for a yoga retreat 2 years ago – a beautiful part of the world. I hope that Sri Lanka can maintain its cultures and traditions as it attracts more and more tourists.